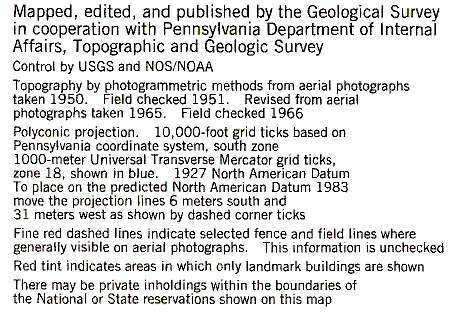 This document is an introduction to how to read topographic maps and some of the sorts of features that you can find on them using examples from central Montgomery County, PA, USA in the vicinity of the Montgomery County Community College (MC3) main campus in Blue Bell. There are quite a few good introductions to topographic maps on the web (the USGS has a very good one), but sometimes it helps to start with a map of somewhere familiar. Below is an image of the Lansdale Quadrangle. This is a 7 ½ minute, 1:24,000 scale topographic map. It is the typical modern USGS topographic map. Most or all of the contiguous 48 states are covered by maps at this level of resolution. This map was compiled both by sending surveyors out to map out the location and elevation of points, and by drawing in additional detail from areal photographs. 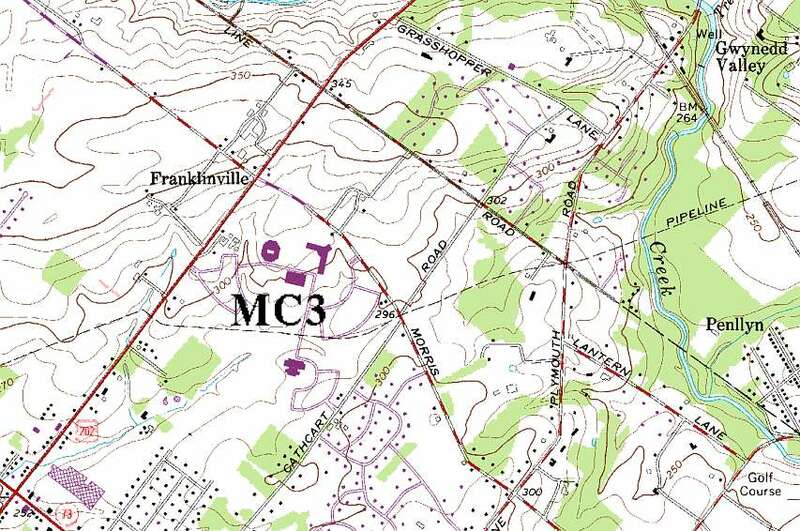 The main Blue Bell campus of MC3 is on this map, and we are going to explore some of its environs. The image below is too low a resolution to see any details, we will be looking at closeups from this map. This map covers part of central Montgomery County. Landale and North Wales are up in the northeast corner, East Norriton and the edges of Norristown are down on the South edge. The big red line running almost North-South through the middle of the map is the Northeast extension of the PA Turnpike. The main MC3 campus is a little bit southeast of the center of the map. The scale gives us a good feel for how far apart two points on the map are. Unfortunately, it doesn't work well here, as the various images I have taken from the map are at different scales. The scale also gives us some other information – it tells us that the contour lines are 10 feet apart – and it says what vertical datum (the thing that tells us what an elevation of 0 feet is) was used to establish elevations on the map. Also on the bottom of the map there is some history information – how old is the information on the map. On this map, this has two parts – one is the original information in black – the map has its basis in aerial photographs made in 1950, with surveyors going out in the field checking elevations in 1951. This was then revised in 1965-66. The map was revised again in 1983, but only from aerial photographs taken in 1981. This information wasn't field checked. All the changes made in 1983 – all of the new features that appeared between 1966 and 1981 – are marked in the map in purple (except, if we read carefully, woodland which is in its usual green color, but represents data from 1981 not 1966). Lots has changed around here in the last 5 years or so, let alone since 1981, so we can expect this map to be quite out of date. At the corners and along the sides of topo quads you will find coordinates – locations of the edges of the maps on the surface of the earth. The Northwest corner of the Lansdale quad is at 40 degrees, 15 minutes, zero seconds North latitude, and 75 degrees, 22 minutes, 30 seconds West longitude. There are also more funny numbers on the sides of the Lansdale quad, such as the 4455000mN in the image to the right. In this case, this is a different grid system, the Universal Transverse Mercator (UTM) grid. This is similar to the military grid reference system. These grids (which are becoming more widely used than they used to be with the availability of GPS recievers that can display your location in UTM or other coordinate systems) allow you to specify a 1 meter by 1 meter square on the surface of the earth (or a 10 meter by 10 meter square, or 100 meter by 100 meter square, or 1 km by 1 km square), and are much more intuitive for some local navigation uses than latitude and longitude. There are lots of other grid systems in use – much of the western US and some of Canada uses a township/section/range grid. Britain and some former british colonies use an Ordinance Survey grid. The top of the map is North – but how North and which North? The bottom of the map tells you that as well. There is a little north arrow (in the image to the right). 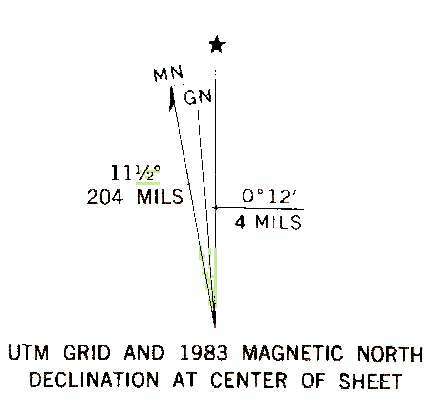 In this case it tells you that the top of the map is aligned to true north and that the UTM grid north is slightly (0 degrees, 12 minutes) west of true north, and that in 1983, your compass would have been another 11 ½ degrees further off from true North. Almost everywhere in the world, Magnetic North is not exactly the same (often 10 to 20 degrees or more off) as True North, and you need to know this difference where you are if you are navigating with map and compass. If you are doing very precise navigation, you may need to know how much change there is per year – as the Earths magnetic field changes and the location of the Magnetic poles is constantly changing. These days you may very well navigate with a GPS receiver as well as with a map and compass (as all the nautical charts say, never depend on any single navigational aid alone...). 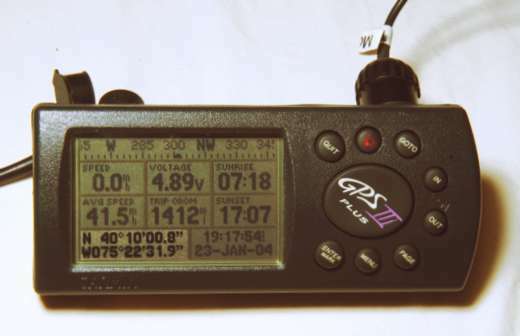 GPS receivers can tell you your location in latitude and longitude, UTM, military grid reference, and most likely lots of other formats. GPS coordinates are often precise enough that you need to know an additional thing that used to be just in the domain of surveyors – the datum. There are vertical datums – the place the 0 elevation is at – and horizontal datums. A horizontal datum is an earth surface model. The earth isn't a perfect sphere, and a datum is a model of how much the earth's surface is warped from a perfect sphere, and how to place a latitude and longitude onto that slightly warped surface. Up in the corner of the map with the latitude and longitude was a funny little + sign, offset a bit from the corner of the map. Enough of this stuff on the edges – lets take a look at some of the things shown on the map. Below is the stuff in the immediate environs of the main MC3 campus in Blue Bell. I have added the letters MC3, they don't appear on the actual map. Note that the college buildings and roads are in purple. They weren't there in 1965, and were there in 1981. Everything in purple was added in the photo-revision in 1983. If you have been around the campus recently you know that things look very different from this now. The roads and parking lots on the campus have changed, and almost all the open space in this part of the map has turned into developments. See if you can locate the following items on the map: US route 202 (a red (largish) road with a red 202 symbol next to it), the natural gas pipline that crosses the campus (black dashed lines), the SEPTA R5 commuter rail line (black lines sort of like a road but with dashes across it, running past Penllyn and Gwynedd Valley), Wissahickon creek (in blue). Colors have meanings on the map. Each little black or purple square on the map is a building (mostly houses) with larger buildings actually drawn to show their shape. Water is in blue, railroads and pipelines and powerlines and such are in black. Roads, depending on their size are in black or red. Wooded areas are in green. Topography is in brown. You can also explore this area online using any of several sources for topographic maps and aerial photographs such as topozone or terraserver. Topography is in brown; this map is a topographic map. It shows topography, that is, hills, valleys, cliffs, canyons, and the like. It does this by drawing contour lines. Just to the north of the college is a long narrow hill (the rise that you go over going north on 202 or west on Morris road from the college). 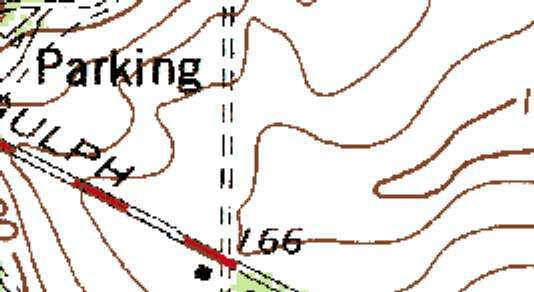 The image above shows you this hill on the map. There is a heavy brown line marked 350. This is the 350 foot contour line. Each point on that line is 350 feet above sea level. On one side of that line the ground is lower in elevation, on the other side it is higher. Inside the 350 foot contour line is another thin brown line. We know from the scale at the bottom of the map that the contour interval is 10 feet – this line is 10 feet higher than the 350 foot contour – it is a line marking 360 feet above sea level (we have to look around elsewhere on the map to figure out if it is 360 feet or 340 – the only hint visible on this bit of the image is the 345 right in the corner of where two of the roads meet in the upper right – this has a little x next to it and was a point that was surveyed (in 1951) to be 345 feet in elevation.) 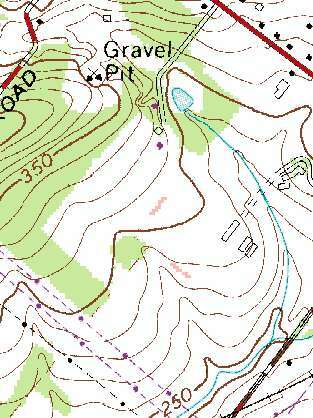 We can go back down to the college buildings (in purple at the bottom center of the image) and cross the 360 foot contour, the heavy brown 350 foot contour, and then three more thin brown contour lines – the college is about 50 feet below the top of this (little) hill. Try to see if you can look at the contour lines circling this hill and imagine the hill rising out of the map in three dimensions. 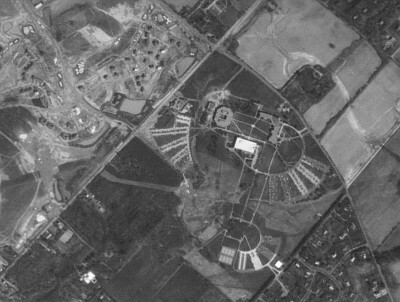 For comparison, here is a 1993 aerial photograph of the campus and its immediate surroundings. Many of the geographic features on the map are also visible on the aerial photograph, but which ground is higher in elevation and which is lower isn't as evident. The topographic lines on the map were drawn from stereo pairs of aerial photographs, with actual elevations at particular points (benchmarks) worked out by surveyors. Much changed between the 1981 aerial photos the map is based on and the 1993 aerial photo. Much has also changed since 1993. The fields shown on the map to the northwest of the college were being torn up and replace by the houses of the development across 202 from the college. The fields to the north of the campus had not yet been developed in 1993. A few miles northwest of the college is North Wales. North Wales has a high concentration of buildings, so rather than trying to draw them all, they are shown on the map as a red area. There are a few landmark buildings marked on the map inside this area – churches (black boxes with with a little cross, the Fire Station, and a square marked PO for post office. All fine and straightforward (except that the North Wales post office has moved). You can see a few developments around North Wales (and additions to the industrial buildings Northwest of it) in purple. These have expanded and changed substantially since this map was made. The SEPTA R5 Commuter rail line runs through North Wales (almost north to south in the center of the image, and you can see a powerline (short black dashes and circles) almost forming an X with it (look right next to Upper Valley Road – the powerline runs behind it). And again, for comparison, here is an aerial photograph from 1993 of North Wales. 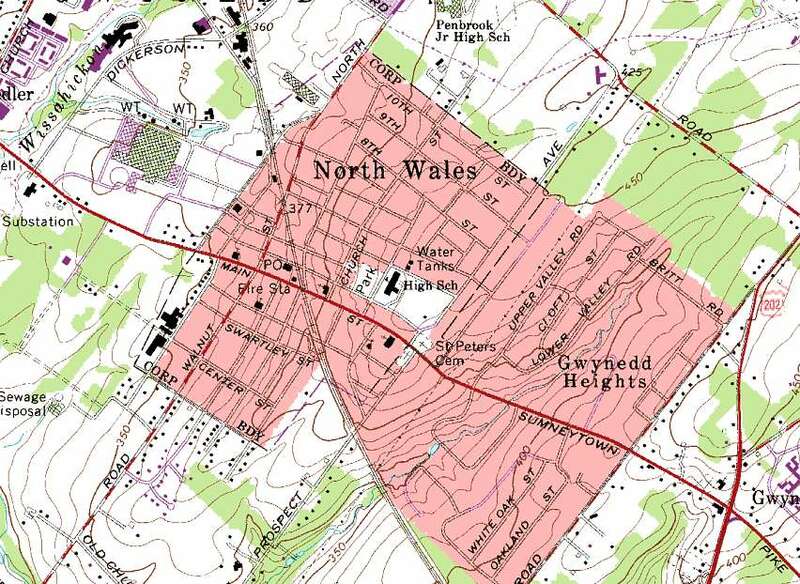 Note that the area marked sewage disposal West of North Wales on the map above, has, by 1993 turned into a development. The SEPTA rail line runs through a shallow railroad cut south of North Wales, and is thus quite clearly visible on the aerial photograph. Likewise, the powerline that crosses the rail line on the southeast side of North Wales shows up a narrow strip of open space. 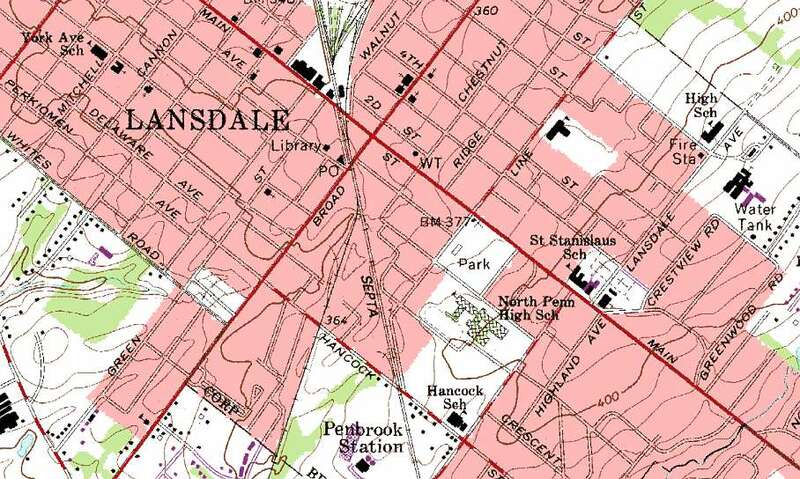 A little bit further away from the college, up in the Northwest corner of the map is Lansdale. 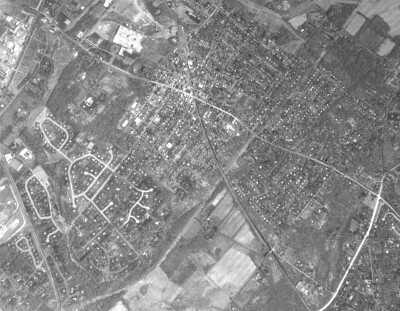 Above is an image of part of Lansdale. You can see lots of the same kinds of features that you have seen elsewhere in the quadrangle. I would like to point out a few others in particular. 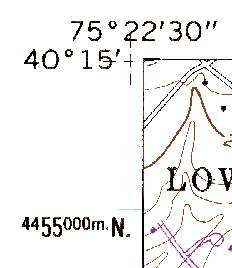 Benchmarks are an important feature you can find on topographic maps. 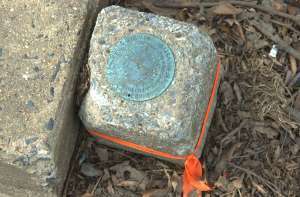 A benchmark is a marker that was placed in the ground when the surveyors were out making the map. 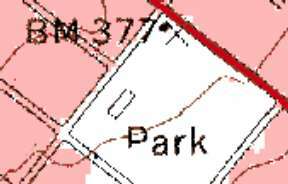 If you go looking in this park in Lansdale, you should be able to find a concrete marker in the ground with a circular brass disk about 3 inches across stuck in it right where the map shows the little x. A surveyor could place a surveying instrument on a tripod above that benchmark, hang a plumb bob from the instrument to hang directly over the center of the brass disk, and know that they were in exactly the same place as everyone else who used that benchmark. Benchmarks are typically marked on topographic maps with their elevation, so this benchmark is 377 feet above sea level. Below is the benchmark from the map above. It only took a few minutes of wandering around the park to locate it. Here is a closeup of the benchmark. A little hard to read, but it appears to be stamped Lansdale No 2, 1935. 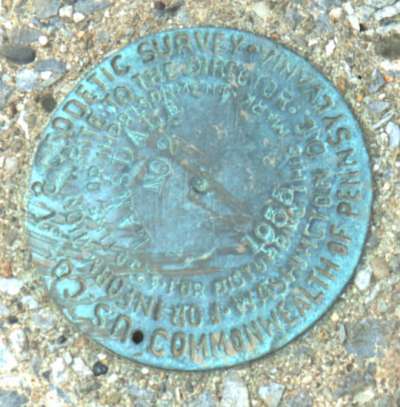 It was emplaced by the US Coast and Geodetic Survey, an agency that has been subsumed into the US Geological Survey. 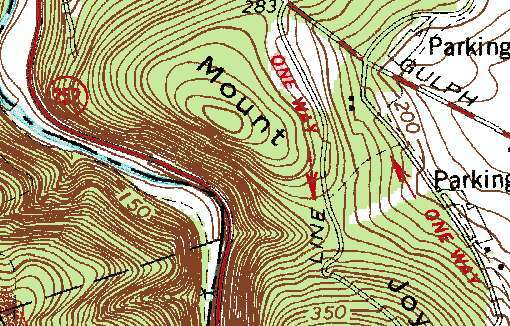 Many different sorts of geographic features are shown on topographic maps. Each of these has its own symbol. Some of these symbols are obvious, others are not. Schools are shown on USGS topographic maps as buildings with a flag. Here is a highschool in Lansdale. See if you can identify what geographic features the map symbols below represent. Below is an image from another topo quad from a little bit further south showing the Valley Forge National Historical Park. You can also look at a high resolution image of the Valley Forge Quad. 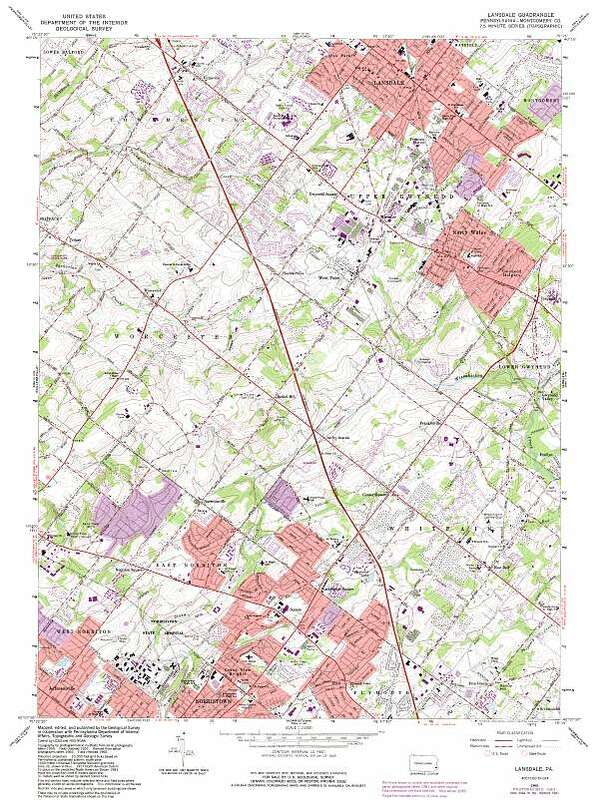 There are lots of things to be seen on this map, though some have changed, as this map is based on aerial photographs from 1980 and field checking in 1981. You can see the Schuykill river cutting through the park. The Montgomery County-Chester County border runs, as is often the case, down the center of the Schuykill river. The cloverleaf patterns of some multi lane highway exits are visible along the East side of the image, but route 422 was under construction at this time, and is visible as a partly completed stretch of highway across the top of the image. 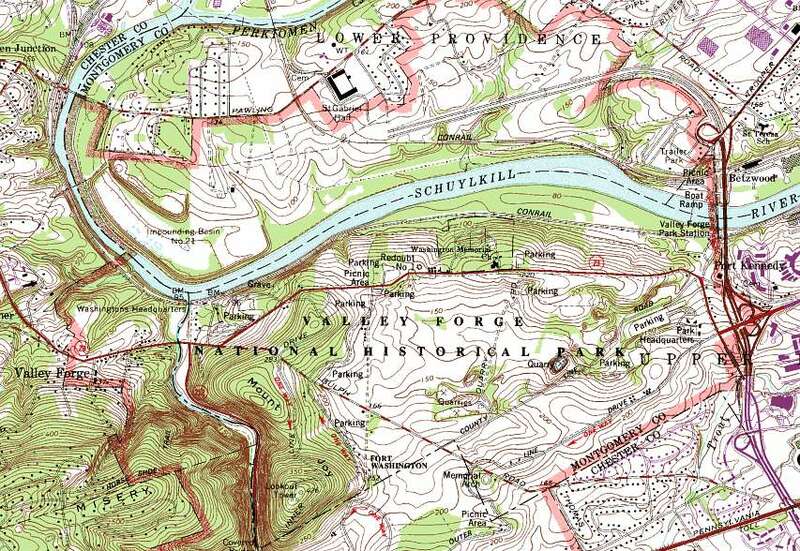 There is more topography in this map than there is around Lansdale, so lets take a closer look at some of it. Areas on a topographic map where contour lines are relatively far apart are relatively flat. In contrast, areas where contour lines are placed close together are steep slopes. Here, the South side of Mount Joy is a very steep slope. The contour lines are 10 feet apart in elevation, and the heavy brown contour lines (which are just a shortcut that allow you to skip the lines between them) are 50 feet apart, so you can count the contour lines to work out how far (this peak of) Mount Joy is above the stream below. 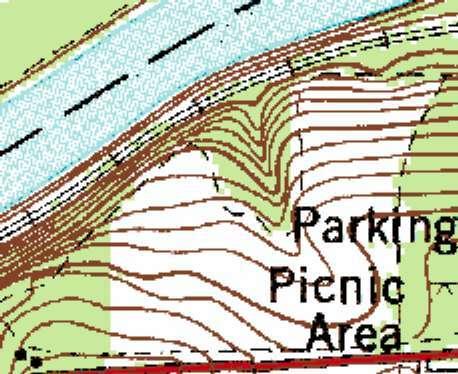 Here is part of the park just to the South of the Schuykill river (along a steep slope where the contour lines are closely spaced (with a rail line running along the bottom (remember the bit about railroad cuts in the landslide presentation)). Note how the contour lines bend away from the river (in the area highighted with the blue circle in the top image, the bottom image shows the map as it actually appears [the blue circle is just something I added to the image to mark the topographic feature of interest]). What is going on here? What happens to the contour lines in the area highlighted by the blue circle? They bend towards the Schuykill river. They stay paralell with the Schuykill river. They bend away from the Schuykill river. What would the land surface look like if you were walking in this part of the park, that is, what feature would you see at the place where the blue dot is. A flat picnic area. A creek flowing south from the river. A gully. A dam. A railroad line running up the hill. Note that the Creative commons licence is applied to just this page, not to the Athro, Limited site as a whole.